If you are lucky, a book will come into your life at precisely the moment that you need it. I had been missing the Harry Potter books for some time, and while I didn’t want to read a clone, ripoff, or wannabe of that series (of which there are many), I did want to read something sort of like it—set in our world, but also not in our world, where things are not always as they seem, but also darker and more broody. If Harry Potter is milk chocolate, I was looking for dark chocolate. 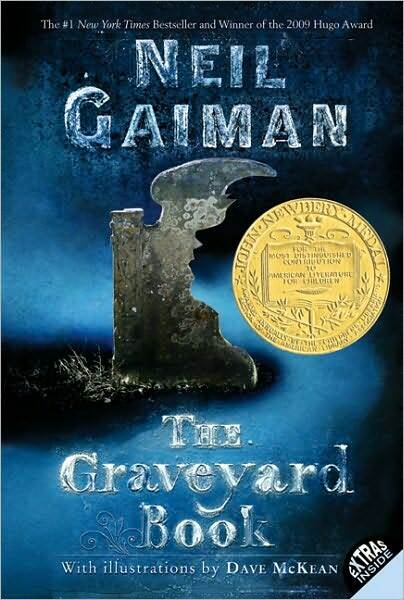 Which is exactly what The Graveyard Book is. It literally is dark, taking place mostly in a graveyard and mostly after nightfall. 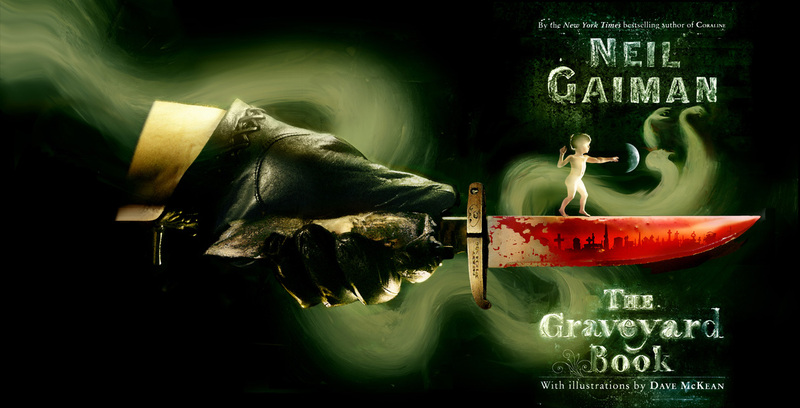 As the book opens, a mysterious man named Jack sneaks into a house and murders the entire family, save their toddler, who escapes into the graveyard next door. The ghosts there decide to raise him and christen him Bod (short for Nobody, which makes him seem as if he stepped whole out of an Emily Dickinson poem—he literally is Nobody). Since ghosts are unable to handle physical items, they recruit Silas, the mysterious, laconic watchman of the graveyard, to be his caretaker. Bod has much to learn as he gets older. Growing up in a graveyard and being raised by ghosts means that Bod knows more about the dead than he does about the living, but even so, there are many things about the dead that he doesn’t understand, either. He has to learn how to be human from those who long ceased being people, as well as from those who may not be entirely human at all. He wants to learn about friendship (and possibly romance), and most importantly, he wants to solve the murder of his family, a murder which he can’t even remember. Part of the joy in reading this book is the strong sense of story that carries through it from beginning to end. Best of all, it’s an original story, and being unique is itself something of a novelty in children’s literature these days. If you want a tight, character-driven story evocative of the Harry Potter books, and yet which is completely different from those books, this is the book for you. Unlike Harry Potter, however, Bod ultimately doesn’t get all the answers he’s looking for, and neither do we. By the end of the book we have followed Bod’s adventures for over 300 pages, and he still does not know who, or what, his guardian Silas is. Silas said, “We do what we have to.” He sounded weary. Silas is a man who holds his cards pretty close to his chest. If Gaiman knows who or what Silas is, he isn’t telling Bod, or us. This isn’t an oversight on Gaiman’s part. He knows that you have to leave some parts out, to let your readers’ imaginations have free rein every once in a while. Even if you think you know who or what Silas is, there is still room for error. I thought I had the character of Jack figured out, but when I later found out who he was, I got the surprise of my life. Not knowing some things is not an issue for me, and it shouldn’t be for you, either. Letting our imaginations out for some exercise is one of the joys of the reading life. Stephen King once wrote that “description begins in the writer’s imagination, but should finish in the readers” (174). That’s a pretty short job description, but that handoff is tricky to achieve. Usually, when a book confuses me, it’s either because of a complicated plot twist, or because the author didn’t provide enough description for me to distinguish between two or more characters or places. (Rare, but it happens.) More typically, I get bored with a book because an author gets too carried away with their powers of description, something that King says happens to him as well (178). As a result, I’m always looking at how other writers describe things: what they include, what they leave out, and why. Occasionally, I’m rewarded with passages of great descriptive power, which allow my mind to form complete, realistic pictures. If, as the story progresses, a gap occurs, my mind is able to fill in that gap almost effortlessly, provided the author has done his work properly to begin with. Ghouls do not build. They are parasites and scavengers, eaters of carrion. The city they call Ghûlheim is something they found, long ago, but did not make. No one knows (if anyone human ever knew) what kind of creatures it was that made those buildings, who honeycombed the rock with tunnels and towers, but it is certain that no one but the ghoul-folk could have wanted to stay there, or even to approach that place. Shivers ran down my spine the first time I read that. At once, a completely formed set of images came into my mind. I though of that lonely abandoned city in a parallel universe that Philip Pullman described in The Subtle Knife, and I also thought, oddly enough, of Salvador Dali’s desert full of melting watches. All those “angles [that] were wrong” reminded me of the stories of of H.P. Lovecraft, who often wrote of twisted geometries that tortured the mind. The images that formed in my mind as I read those two paragraphs are not limited to what I mentioned above, but go far beyond it. This is a case when the total is far greater than the sum of its parts. Those images are based on my experiences as a reader and as a person, and since your experiences are different than mine, I’ll bet you visualized something different than I did when you read the above passage. But I would also bet good money that if you had read the entire book up to that point, the images in your head, however different they were from mine, would be as complete, if not more so, than mine. The illustrations in this book, by Dave McKean, with their quirky, energetic lines, add to the dark overtones of the book without weighing it down, adding to the humanity of the book. One of the joys of the reading life is rereading a book that we’ve already read. We can never experience a book for the first time twice (and such are the dangers of nostalgia, but I’ll have more to say about that later), but there are many books that repay rereading. This is one of them. I’m going to wait a few months—possibly until October—and then I’m going to read this one again, hopefully after dark, and hopefully by candlelight. If you enjoy it as much reading it the first time around as I do the reading it the second time, I guarantee you’ll love it. Gaiman, Neil. The Graveyard Book. Illus. Dave McKean. New York: Harper-HarperCollins, 2008.